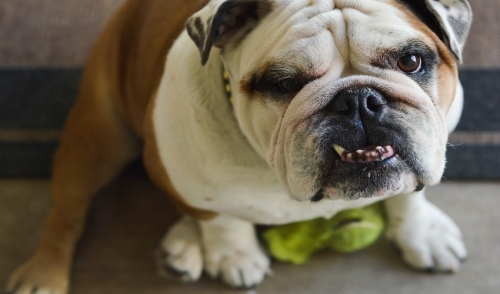 An overbite might not seem like a serious condition for your dog, but severely misaligned teeth can lead to difficulty eating, gum injuries and bruising, bad breath and different types of dental problems, including tooth decay and gingivitis. Fortunately, there are ways to help fix the problem before it becomes irreversible. An overbite is a genetic, hereditary condition where a dog's lower jaw is significantly shorter than its upper jaw. This can also be called an overshot jaw, overjet, parrot mouth, class 2 malocclusion or mandibular brachynathism, but the result is the same – the dog's teeth aren't aligning properly. In time, the teeth can become improperly locked together as the dog bites, creating even more severe crookedness as the jaw cannot grow appropriately. This problem is especially common in breeds with narrow, pointed muzzles, such as collies, shelties, dachshunds, German shepherds, Russian wolfhounds and any crossbred dogs that include these ancestries. Dental examinations for puppies are the first step toward minimizing the discomfort and effects of an overbite. Puppies can begin to show signs of an overbite as early as 8-12 weeks old, and by the time a puppy is 10 months old, its jaw alignment will be permanently set and any overbite treatment will be much more challenging. This is a relatively narrow window to detect and correct overbites, but it is not impossible. Small overbites often correct themselves as the puppy matures, and brushing the dog's teeth regularly to prevent buildup can help keep the overbite from becoming more severe. If the dog is showing signs of an overbite, it is best to avoid any tug-of-war games that can put additional strain and stress on the jaw and could exacerbate the deformation. If an overbite is more severe, dental intervention may be necessary to correct the misalignment. While this is not necessary for cosmetic reasons – a small overbite may look unsightly, but does not affect the dog and invasive corrective procedures would be more stressful than beneficial – in severe cases, a veterinarian may recommend intervention. There are spacers, braces and other orthodontic accessories that can be applied to a dog's teeth to help correct an overbite. Because dogs' mouths grow more quickly than humans, these accessories may only be needed for a few weeks or months, though in extreme cases they may be necessary for up to two years. If the dog is young enough, however, tooth extraction is generally preferred to correct an overbite. Puppies have baby teeth, and if those teeth are misaligned, removing them can loosen the jaw and provide space for it to grow properly and realign itself before the adult teeth come in. Proper extraction will not harm those adult teeth, but the puppy's mouth will be tender after the procedure and because they will have fewer teeth for several weeks or months until their adult teeth have emerged, some dietary changes and softer foods may be necessary. An overbite might be disconcerting for both you and your dog, but with proper care and treatment, it can be minimized or completely corrected and your dog's dental health will be preserved.